“God, who got you started in this spiritual adventure, shares with us the life of His Son and our Master, Jesus.” (1 Corinthians 1:7, The Message) What does it mean to be on an 'adventure with God?' The word ‘adventure’ is defined as “an undertaking usually involving danger and unknown risks; an exciting / remarkable experience.” Synonyms for ‘adventure’ included "quest , venture, mission, expedition and exploration.” The ultimate adventure in this life is living courageously…selflessly… in full surrender to the divine cause of Jesus Christ … following His steps – day by day on this Journey called LIFE – this is what it truly meant by the term ‘spiritual adventure’ in today’s text. We have to realize that a call to a life of spiritual adventure is not new for followers of Jesus Christ - “Adventure” was the first disciples’ daily itinerary! Listen to Jesus’ instruction to the first disciples, “Take nothing for your journey… Don’t take a walking stick, a traveler’s bag, food, money, or even a change of clothes” (Luke 9:3, NLT) Wow … no iPod Touch or laptop computers (Brother Gene, you and I would have been in trouble! ), no DayTimer, no scheduled appointments, no detailed road maps, no traditions to hold onto (because a walk with Christ was a brand new way of life! 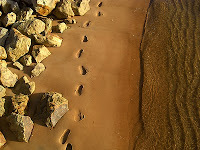 ), no church business meetings nor Robert’s Rule of Order – only the call to walk (journey) in the Messiah’s footsteps. That’s why the term ‘disciple’ was used – it means “a learner, a student under the teaching a Master.” But for many Christians today, something seems to be foreign to this First Century model of Christianity – things often seem backwards when you look at the 21st Century Church and the First Century Church. Many practice today what I call “Inverted Christianity” – that is the concept of believers inviting the Spirit to “follow us” instead of our “following Him!” … it is when we want Him to “serve our purposes” instead of our “serving His purposes!” … it is asking Him to bless our plans / our journeys instead of our blessing His through our obedient walk with Him! When our personal relationship with God is anything less than adventurous; when it is less risky and more comfortable then perhaps we’ve settled for something far less than the journey God has planned for us – perhaps we have become mere participants in Inverted Christianity, or maybe put another way, we’ve become domesticated disciples! Pastor Mark Batterson in his book Wild Goose Chase (2008), addresses this domesticating process that is prevalent in the hearts of many believers today, “I wonder if churches do to people what zoos do to animals ...Too often we take people out of their natural habitat and try to tame (domesticate) them (all) in the name of Christ.” More & more of today’s preachers preach a pseudogospel that removes the risk …removes the danger …removes the struggles …removes the pain and removes the unknowns! And what we end up with is … Caged Christians (i.e. tamed / domesticated believers) who choose to live in various cages that NEVER satisfy our soul! But this was never meant to be God’s plan – not for the First Century Church and neither for His 21st Century Church. We as genuine believers have a standing invitation to be on “spiritual adventure” with the Savior of the World every single day … we are to start each new day that He gives us with a heart filled with spiritual expectancy for where God will lead us and who God will bring across our lifepath. There is a famous Spanish saying that we all need to commit to our hearts …“Otro día, otra aventura!” which means “Another day, Another adventure!” We were never called to travel in the spiritual adventure alone – for God shares with us “the life of His Son and our Master, Jesus” and like-minded believers (fellow sojourners; Philippians 2:1-3) which He calls His Church. Listen to the words of 1 Kings 18:21 which sums up God’s call to this spiritual adventure - “If the Lord is God, (then) follow Him!” OK, let’s saddle up for a Great Adventure ...together! Today's Spirit-led video is by CCM artist Steven Curtis Chapman and can be viewed by clicking on the on the song title, "The Great Adventure" - G3 for God's beautiful and spirit-filled gift of ministry thru Christian music!